where RH = (2p2me4k2Z2)/ch3 = 1.096776 x 107 m-1 is the Rydberg constant. (More on the Rydberg Constant.) Here we use the reduced mass m = (Ampme)/(Amp+ me), and the value given is numerically correct only for hydrogen (atomic mass A= 1). We also use Z= atomic number = 1 for hydrogen, but I write it in terms of Z because it is valid for any atom with a single electron (e.g. He II). The transitions shown above correspond to absorption of energy by the atom, but reversing the arrows (transitions from higher to lower states) corresponds to emission. The energy differences corresponding to the transitions labeled Lyman Series correspond to UV emission. Those labeled Balmer Series are in the optical range (e.g. hydrogen alpha is the 3 to 2 transition). How would one get radio emission, say at 5 GHz? nab = RHc[1/1092-1/1102] = 1.5 x 10-6RHc = 5 x 109 Hz. This transition would be called the H109a transition, where a transitions are those for which Dn = 1. Transitions for Dn = 2 would be termed b transitions, and so on. So transitions in very high energy levels yield radio lines, called Radio Recombination Lines. Note that these transitions are so far from the atom that the same basic formula can work for higher atomic weight neutral atoms, e.g. He I, using the effective potential eZ = 1, so long as the appropriate reduced mass is used. Radio recombination lines arise in HII regions, which are regions of the interstellar medium where the ordinarily neutral hydrogen gas is ionized by a nearby hot star, whose light is rich in UV photons. The UV photons ionize the atoms, and the electrons recombine and cascade downward toward the ground state. Some fraction (given by the Boltzmann and Saha equations) make the transition from 110 to 109, and emit a 5 GHz photon. Although the density of the interstellar medium is low (perhaps 104cm-3), the path length is long (~0.5 pc), so the emission can be observed as a weak radio line. Note that transitions around H40a are in the 100 GHz (millimeter) range, and around H600a are around 30 MHz range, so the entire radio spectrum can provide recombination lines. An important question is how broad are these recombination lines? The "natural" width of lines is the inverse of their lifetime (how long they stay at one level before transitioning to the other level). These lifetimes are rather long, so the intrinsic width of the lines is narrow (about 0.1 Hz!, see here). However, their observed width is mainly due to "Doppler broadening" resulting from motions of the atoms. This could be due to a combination of thermal motions and turbulent motions. The level of turbulence is not generally known, but the thermal broadening can be calculated based on an estimate of the temperature of the population of emitting atoms and any excess broadening can be ascribed to turbulence. For a thermal (Maxwellian) distribution, the distribution of speeds of the atoms is determined uniquely by the temperature, and a concise derivation of the thermal doppler width can be found here. The result is given as . Which is the lowest energy state? Consider magnets, which want to be antiparallel, so the figure on the right represents the lower energy state. These magnetic moments are associated with the quantum property called spin, but the electron magnetic moment is opposite to the electron spin (due to the electron's negative charge). The lowest energy state is when the magnetic moments are anti-parallel, at which time the spins are parallel. Note that this spin flip is a magnetic dipole transition, and is highly forbidden by the quantum rules, but occurs spontaneously once every few million years for an isolated atom. Note that collisions in the interstellar medium occur far more often--about once every 400 years or so, and such collisions randomly cause spin flips. So there are atoms in about equal numbers in both energy states. Even though the spin flip is very rare for an individual atom, there is a truely staggering number of atoms along any line of sight, so the radio line produced by the spin flip is strong in all directions. The energy difference corresponds to a frequency of 1420 MHz, or a wavelength of 21 cm. Neutral hydrogen traces interactions among galaxies in the M81 group. E = (h/2p)2 J (J + 1) / 2mr2 . It is straightforward to show that the rotational transition J = 1 to 0 of the CO molecule results in a spectral line at frequency 115.2712 GHz, while the J = 2 to 1 transition gives a line at 230.5424 GHz, given that the intermolecular bond distance is 1.128 A. These are but two of many molecular lines that can be detected from clouds in interstellar space and in other galaxies to provide information on the distribution of cold, dense matter. Note that CO and other molecules are easily dissociated by radiation and collisions by hot gas atoms, so its presence implies very cold conditions. Typically molecular clouds have temperatures of order 100 K, and sometimes as cold as 10-30 K. They are associated with dust clouds, and it is the dust that protects the fragile molecules and helps to cool the cloud by radiation of IR. 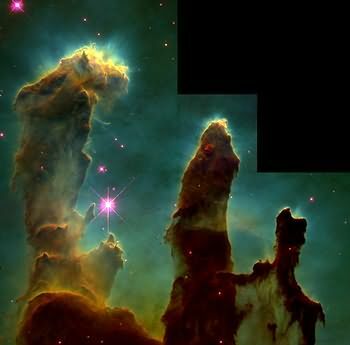 Image of M16 (Eagle Nebula) molecular cloud and star-forming region. From HST web site. The emission types that we have discussed up to now are transitions between bound states, for which quantum mechanical rules are of the first importance. However, for astrophysical plasmas in a high-energy environment, such as in stars, or the tenuous atmosphere around stars, it is free particles that dominate the radio emission mechanisms. (Note that bound state transitions can still be important at UV and soft X-ray wavelengths in such high-energy plasmas.) This includes all radio emission from the Sun and in the interplanetary medium, including the Earth's magnetosphere and ionosphere. 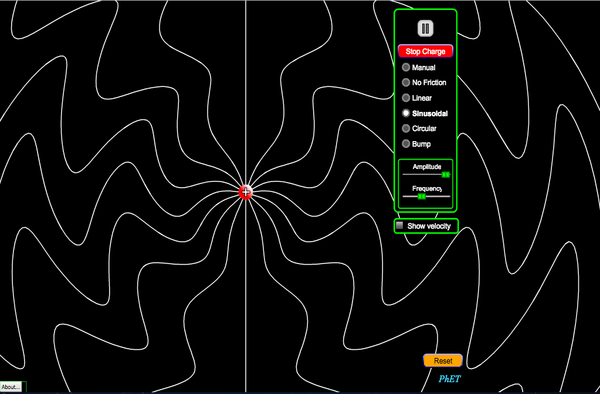 which is a radial field falling off as 1/r2. The power radiated is the square of the electric field, so the power from the radial part of an electrostatic field vanishes quickly, as 1/r4. However, when a transverse "kink" appears in the field, that transverse part falls off only as 1/r, so the power falls off as 1/r2. So any phenomenon that produces a kink in the field will result in radiation. The typical way to produce a kink in the electrostatic field of a charge is to accelerate the charge. where q is the charge, a is the acceleration, and q is the angle from the direction of the acceleration. Note that the "radiation pattern" is a dipole pattern, which looks like this: and the pattern arises naturally from the geometry. A dipole antenna (where charges travel in simple harmonic motion up and down the antenna) has exactly this radiation pattern. In the case of relativistic motion of charged particles, the pattern is altered, as we will discuss shortly (see Jackson, 2nd edition, section14.3). To get the total power radiated, simply integrate (1) over all solid angle to get P = 2/3 q2a2 / c2. What kind of charged particles are good at radiating? Note that the force required to produce an acceleration is F = ma, so the acceleration is a = F/m, and dP/dW ~ 1/m2. So electrons are better at radiating than protons by a factor (mp/me)2= 4 x 106 ! For radio emission, we can assume that the only particles important for the emission are electrons. For completeness, we briefly mention that the velocity of a free charge moving in a medium can actually exceed the speed of light in the medium. This causes the light to radiate in a cone, exactly like sound waves from an aircraft that exceeds the speed of sound. This effect gives rise to Cherenkov emission, which is responsible for the blue glow given off by nuclear reactors that are surrounded by water, and for emission by cosmic rays in the Earth's atmosphere. This is one of the few mechanisms that can result in radiation without the need for the particle to accelerate. Cherenkov emission plays no role in radiation in plasmas, however, because the wave speed of light in an ionized medium is greater than c! This is an important type of radiation in many astrophysical plasmas. The word is german for "braking radiation," as is due to accelerations caused by collisions between electrons and ions (Coulomb collisions). Recall that the Coulomb force is F = qE, so the force on an electron in the electrostatic field of a proton is an attractive force F = -e2/r2r. In head-on collisions, the electron can actually bounce off the proton, and lose most of its energy, or even reverse its direction. In this case, the energy of the photons emitted is typically in the X-ray range. The hard and soft X-rays from astrophysical plasmas, including the Sun, are a mixture of bound-bound atomic transitions (soft X-rays), nuclear line emission (hard X-rays/gamma rays), and electron bremsstrahlung. In the hard X-ray range (10-1000 MeV), the emission is purely electron bremsstrahlung. Radio emission, in contrast, is due to relatively gentle, distant collisions of electrons with ions. Picture the plasma as a soup of electrons and ions, with the electrons zipping around at great speed through the relatively immobile ions. The path of an electron is continually wiggling due to slight deviations as it passes each ion, and each wiggle produces radiation in a broad spectrum (related to the energy lost or gained in each collision). Note that in the case of local thermodynamic equilibrium (LTE), the electron is also absorbing radiation in approximate equality with its energy loss. We will only discuss emission today, but will discuss absorption next time. of motion (perpendicular to its acceleration). Let us look a bit more closely at a single collision. As shown in the figure below, the electron experiences a deviation of its straight line path by an angle q, which depends on the speed of the electron and the distance of the encounter, which is called the impact parameter, b. Bremsstrahlung has the peculiarity that the amount of deviation (and hence the power radiated) is actually greater when the electron is moving more slowly, and smaller when v is high. We will see this when we get to the final form of the emissivity. It is conventional to write this as dW / dwdVdt = 16pe6neniZ2/(33/2c3me2v) Gff(T,w), (4) where Gff(T,w) is the Gaunt factor: Gff(T,w) = (31/2/p) ln [p(kT)3/2 / 21/2Ze2me1/2 w]. (c.f. Dulk 1985). where we have made the assumption that the electron velocities are the thermal velocities, v = (2kT/m)1/2. Gaunt factors for many other cases can be calculated exactly (see Figure 5.2 of Rybicki and Lightman 1979). hn = (26pe6/3mec3)(2p/3mekT)1/2 neniZ2 Gff(T,n). Note that for the solar corona, neniZ2 ~ ne2, so the emissivity depends on the square of the electron density, and is inversely proportional to temperature (emissivity goes down for higher temperatures!). Also note that there is almost no frequency dependence--the only dependence is the weak (logarithmic) dependence in the Gaunt factor. We will see next time, when we introduce the absorption coefficient, that this is only true when the emission is optically thin. It is important to recognize that the mechanism of Bremsstrahlung is not defined solely for a thermal distribution of particles (it is a common mistake to assume so). Calculation of Bremsstrahlung for other types of distribution is still a research topic, e.g. the recent paper by Fleishman and Kuznetsov (2014), which discusses emission from the kappa distribution and the n-distribution. will gyrate in the direction of your fingers. A proton gyrates in the opposite direction. Cyclotron emission: In the non-relativistic case (low electron velocity, i.e. low temperature), the electrons gyrate at a fixed frequency, independent of their speed, called the gyrofrequency wB = eB/mec, which depends only on magnetic field strength. The emission from a single electron, when viewed from afar, has a radiated power that varies sinusoidally, which gives rise to a cyclotron line at the gyrofrequency, fB = eB/2pmec = 2.8 x 106 B Hz (B in gauss). f = sfB = seB/2pmec = 2.8 x 106 sB Hz (s = 1, 2, 3, ...). This type of emission is responsible for bright coronal emission from solar active regions. Gyrosynchrotron emission: At mildly relativistic speeds (electron energies 100-300 keV), the effect becomes stronger, and the lines go up to harmonics 10-100. The lines also become broader (thermal broadening), so that they blend together into a continuum emission. This form of the emission is called gyrosynchrotron emission, and is the type of emission responsible for most radio emission from solar and stellar flares. Synchrotron emission: At highly relativistic speeds, the forward lobe becomes a narrow beam of width 1/g3, and the emission comes in narrow pulses at the cyclotron frequency, beamed along the direction of motion. The pulses contain many many harmonics. This kind of emission is important in extreme energy environments such as black holes, neutron stars, and some extragalactic sources (generally associated with black holes). These characteristics are for a single electron, or by extension a mono-energetic population of electrons. To determine the expected emissivity from a plasma, one must integrate the contribution of emission over a particular velocity distribution of electrons. There is a lot of effort in trying to determine an appropriate distribution to use for a given situation, and this is an area of active research. Typically there are two types of population that we consider: a thermal population (in which case the emissivity is expressed in terms of plasma parameters T, ne, and magnetic field parameters B andq), or a powerlaw distribution in energy (in which case the emissivity is expressed in terms of energy distribution parameters N, d, and perhaps Eo, and magnetic field parameters B andq). To round-out our discussion of radio emission mechanisms from free particles, it is worthwhile to point out a relatively new mechanism proposed for astrophysical plasmas, although it is a well-known mechanism in devices. This mechanism shares one characteristic with Cerenkov emission, in the sense that no acceleration is required to produce the emission. Instead, the transverse component of the electric field is produced by an inhomogeneity in the refractive index of the medium. To understand how the mechanism works, recall that the electrostatic field of a charged particle radiates outward with the group speed of light in the medium. Slight irregularities in these radiated field lines will occur when the group speed is not uniform. The mechanism was originally considered for the case of a density transition, hence the name Transition Radiation, but for astrophysical plasmas, where such density transitions would be smoothed out by motions of the hot particles, it is more appropriate to consider the case of density fluctuations. In the case of such density fluctuations, perhaps due to wave turbulence in the plasma, it was first shown that the intensity of the radiation is very small and perhaps undetectable, for a reasonable level of turbulence. But recently Platinov and Fleishman have considered the case of emission near the plasma frequency. They found that there is a large enhancement of the emission due to the plasma frequency resonance, and so they gave emission in this regime the name Resonant Transition Radiation. We might expect an effect near the plasma frequency because the group speed of electromagnetic waves in a plasma approaches zero as the frequency of the waves approaches the plasma frequency. The discussion so far as been about incoherent emission, in which electrons act separately to produce their emission. In this case, n particles produce n times the emission of one particle, and the photons emitted have no coherence--that is, no phase relationship. In this case the brightness temperature is related to the effective energy of the individual particles--the actual temperature in the case of a thermal distribution of particles, or the kinetic temperature for a non-thermal distribution. It is also possible for electrons to act together to produce electromagnetic radiation, in which case the electrons all undergo acceleration in phase, acting together to produce photons that are in phase. In this case, the brightness temperature can far exceed the actual temperature or kinetic temperature of the electrons. In the case of the Sun, coherent bursts can reach brightness temperatures of 1015 K! Under some circumstances, the damping rate can be negative, so that we have negative damping (or negative absorption), i.e. wave growth. In this case, g is called the growth rate. Typically, different coherent mechanisms will produce this kind of linear growth over 3 or 4 e-folding times, and then the linear growth will saturate due to some non-linearity, such as running out of energy available for growth. where the units are cgs units, and so the electron density is expressed in units of cm-3. This is the natural frequency of oscillation of a plasma, so any disturbance that provides energy to the plasma is likely to generate Langmuir waves at this frequency. Note that Langmuir waves themselves are longitudinal electrostatic waves, and are not observable from outside the plasma. However, under certain circumstances they can excite transverse (electromagnetic) waves at the same frequency that can escape. As an important example, imagine a distribution of fast electrons in the so-called bump-on-tail distribution, as shown schematically below: Here the electrons are said to form a beam, where the electrons stream along the magnetic field. The positive slope on the energy distribution is a source of free energy, and plasma waves can grow at the expense of the electron energies. These plasma waves can then scatter off ions (or couple to low-frequency ion-acoustic waves), to generate radio waves at the plasma frequency: wl + wi = wp. In addition, two plasma waves going in nearly opposite directions can interact to produce radio waves at twice the plasma frequency: wl + wl = 2wp. This is called "2nd-harmonic" emission, and is an example of the wave-wave interactions mentioned at the beginning of this lecture. Here is an example of radio emission produced by an electron beam traveling outward in the solar corona: As the electrons stream outward, the electron density in the corona falls greatly, and the corresponding radio frequency of the emission goes to lower frequency. If we know the speed of the electron beam, we can deduce the density in the corona and interplanetary space. Conversely, if we know the radial density profile we can deduce the speed of the electrons. It is very important to understand that the intensity of the emission is only a function of the number of e-folding times over which growth occurs, and is not a diagnostic of the electron energies or other parameters of the source. This is a general property of coherent emission--intensities do not provide a useful diagnostic (at least not that we know how to interpret). see a distribution with a positive slope in their inertial frame. In the equation above, the gyrofrequency is WB = eB/mec, as before, but now we explicitly include a term kv||, which represents the doppler shift of waves of wavenumber k seen by particles moving at speed v||. Note that there is no positive slope in energy in the "rest" frame of the distribution, but there is for the wave frame. The result is that huge amounts of energy are available to go into production of radio waves near harmonics of the gyrofrequency. ECM emission is thought to be responsible for bursts seen in the outer atmosphere of Earth, called kilometric radiation, and in Jupiter's magnetosphere. It is also responsible for extremely bright, narrowband bursts from the Sun and stars, called spike bursts. The largest solar radio burst ever recorded, on 2006 Dec 06, was due to millions of individual spikes of this coherent mechanism. Below are some plots of the data from this event. Dynamic spectrum of a solar burst that occurred on 2006 Dec 06 and produced the largest solar radio flux density on record (> 1 million sfu). The vertical scale is 1-18 GHz, logarithmically spaced, with 1 GHz at the bottom and 18 GHz at the top. The time scale is shown in the figure below. This images is scaled to the much lower flux density of the main gyrosynchrotron emission, so that the very bright coherent emission at low frequencies (bottom of the image) is greatly overexposed. The figure below shows this portion of the spectrum in more detail. For this burst, we had the FASR Subsystem Testbed operating, which gives very high frequency and time resolution. The top image is the dynamic spectrum over the frequency range 1.0-1.5 GHz, at about 4 s time resolution. The plot below this shows the flux density on a logarithmic scale. The lower plot, in red, shows a decrease in signal-to-noise ratio on a GPS receiver. The radio noise from this burst directly impacted the GPS signal, causing receivers over the entire sunlit hemisphere of Earth to fail. This shows two levels of zoom into the high frequency and time resolution data. The upper (red) plot shows individual spike bursts for about 2 seconds near the end of the event. The lower (blue) plot shows the full 1 us time resolution for the region in the vertical white lines of the upper plot. Notice that the spikes are narrow band (about 3-5 MHz wide) and come and go on a timescale shorter than 20 ms.